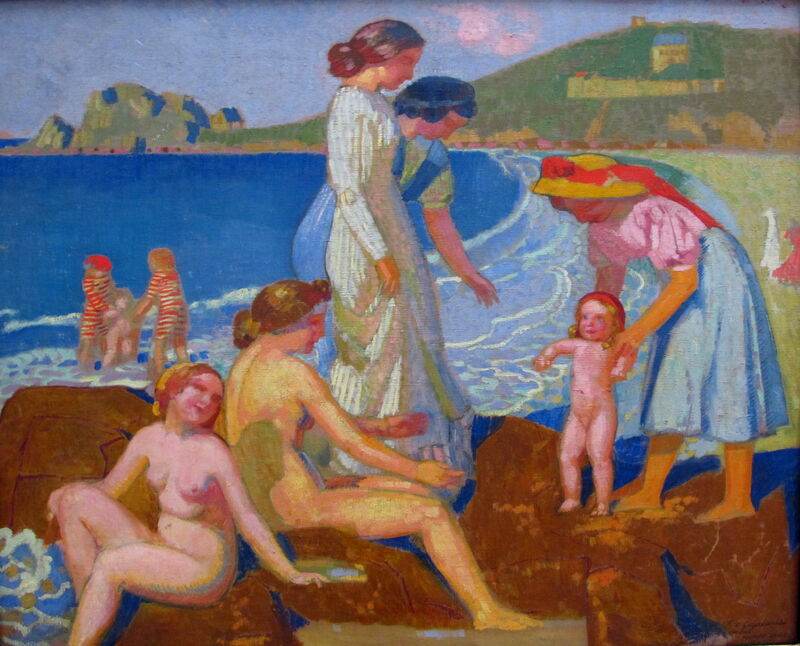 Maurice Denis (1870–1943), Female Bathers at Perros-Guirec (c 1912), oil on canvas, 98 x 122 cm, Petit Palais, Paris. Image by Sailko, via Wikimedia Commons. By the start of the twentieth century, the former Nabi artist Maurice Denis (1870–1943) was firmly in the avant garde, his paintings evolving away from his earlier Nabi style, and making series of prints. He had started serious print-making around 1890, and had made woodblocks for music by Debussy. His prints became even more important in the early twentieth century, when he illustrated writings by an eclectic range of authors including Dante, Verlaine and Saint Francis of Assisi. 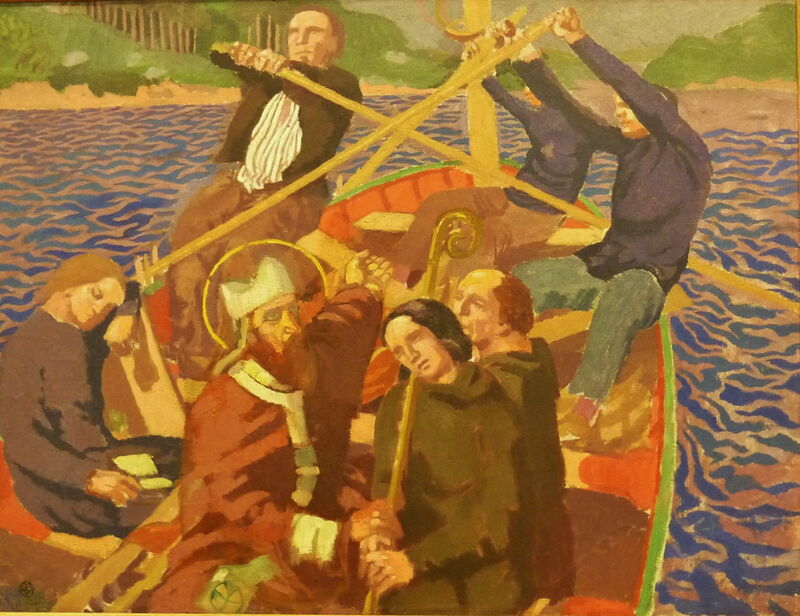 Maurice Denis (1870–1943), Boat to Saint Breton, or Portrait of Albert Clouard as a Saint (1903-06), oil on canvas, dimensions not known, Musée des beaux-arts de Morlaix, Morlaix, France. Wikimedia Commons. Many of Denis’ themes remained religious, such as his Boat to Saint Breton, or Portrait of Albert Clouard as a Saint painted between 1903-06. This may refer to a legend of the life of the first Breton saint, canonised in 1247, or to one of its seven founding saints. Albert Clouard (1866-1952) was a contemporary painter, and presumably a friend of Denis at the time. Maurice Denis (1870–1943), Polyphemus (1907), oil on canvas, dimensions not known, Pushkin Museum of Fine Arts Музей изобразительных искусств им. А.С. Пушкина, Moscow, Russia. Wikimedia Commons. In the twentieth century, Denis started painting a series of works telling stories from classical myths, mainly set on the coast of Brittany and in modern times. Polyphemus from 1907 is one of the earliest of these. Maurice Denis (1870–1943), Bacchus and Ariadne (1907), oil on canvas, 81 x 116 cm, The Hermitage, Saint Petersburg, Russia. Wikimedia Commons. Like Polyphemus, Bacchus and Ariadne from the same year is a radically modern treatment of the story of Ariadne’s abandonment on the island of Naxos, which could be mistaken for a recreational beach scene at a coastal resort. Buried in there, though, are some more traditional references. Just to the right of centre, Dionysus stands behind Ariadne, helping to hold a red and white striped cloak or sheet on her left shoulder. Ariadne’s three attendant nymphs appear to be resting on the rocks at the left. Various bacchantes and other figures are riding black horses down in the water at the right, one of them clutching the thyrsus (staff). There is no sign of Silenius, a chariot, or big cats, and a yacht at the right edge may not have anything to do with the narrative. Maurice Denis (1870–1943), At the Edge of a Battlefield, Joan of Arc, Kneeling, Prepares to Receive the Sacrament of Communion (1909), oil on canvas, 102.5 x 111 cm, Musée des Beaux-Arts, Lyon, France. Courtesy of Musée des Beaux-Arts de Lyon, via Wikimedia Commons. 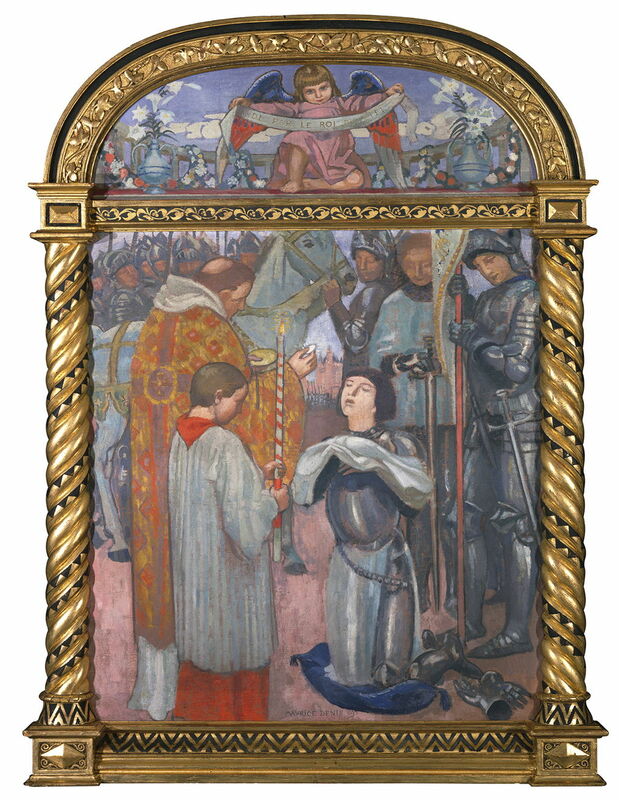 Denis also visited the popular story of Joan of Arc, in this ornately-framed painting At the Edge of a Battlefield, Joan of Arc, Kneeling, Prepares to Receive the Sacrament of Communion from 1909. That same year, Denis started to teach at the Académie Ranson in Paris, and wrote a book on his theories of art. With the rise of the next generation of artists, particularly Henri Matisse who was just emerging from his early Fauvism, Denis’ work started to fall from grace and appear dated. 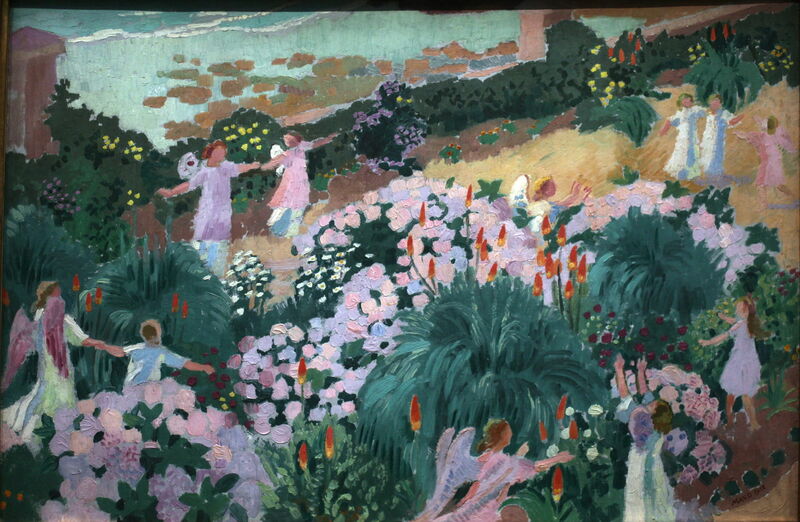 Maurice Denis (1870–1943), Paradise (1912), oil on panel, dimensions not known, Musée d’Orsay, Paris. Image by Rama, via Wikimedia Commons. His 1912 painting of Paradise puts angels with wings into a very earthly and floral imagining of Heaven, not too far removed from Bonnard’s paintings of the same period. Unlike the paintings of Pierre Bonnard, Denis had painted very few nudes, and his domestic scenes were thoroughly respectable, in accordance with his beliefs. 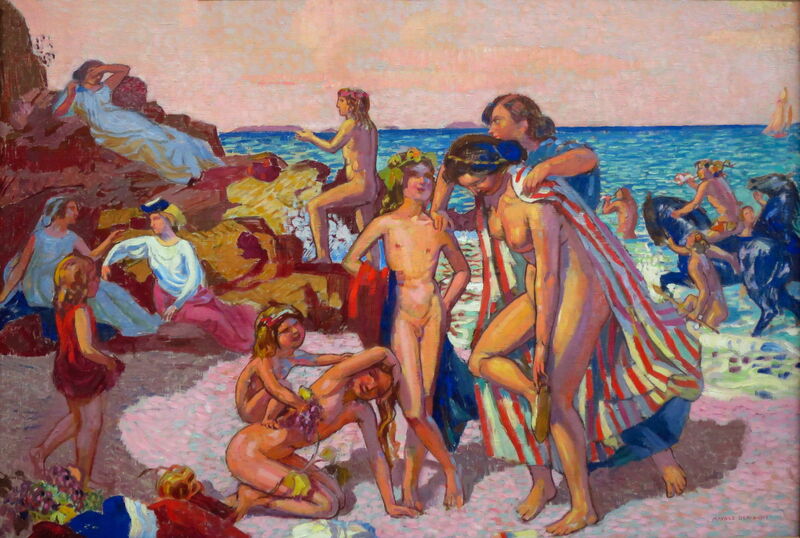 He relented a little and included some classical nudes, both in his mythological paintings and other coastal scenes such as Female Bathers at Perros-Guirec from about 1912. This has almost become Fauvist in its use of colour. Just on the outbreak of the First World War, Denis bought the former hospital in Saint-Germaine-en-Laye, which he decorated and called The Priory, and now houses the largest collection of his works. 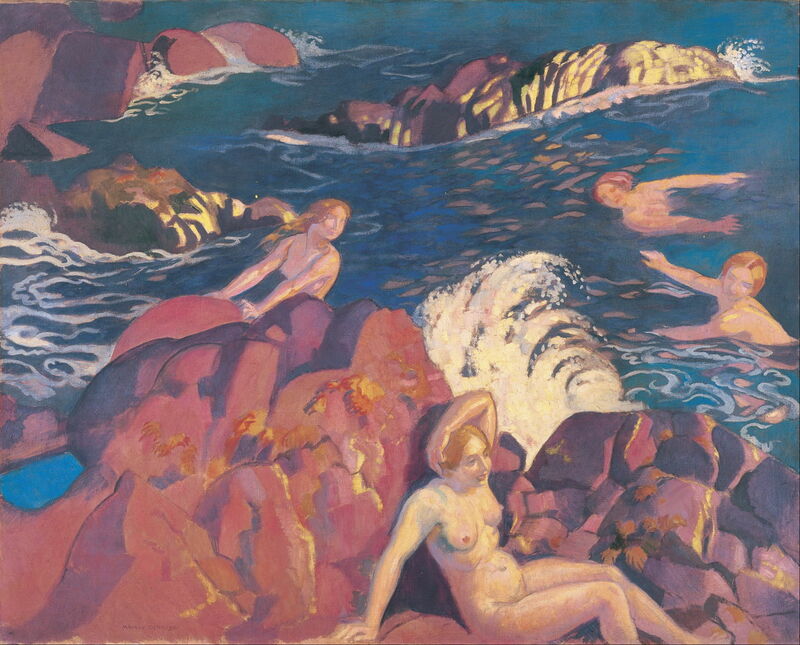 Maurice Denis (1870–1943), Wave (1916), oil on canvas, 100 x 124 cm, Ohara Museum of Art 大原美術館, Kurashiki, Japan. Wikimedia Commons. 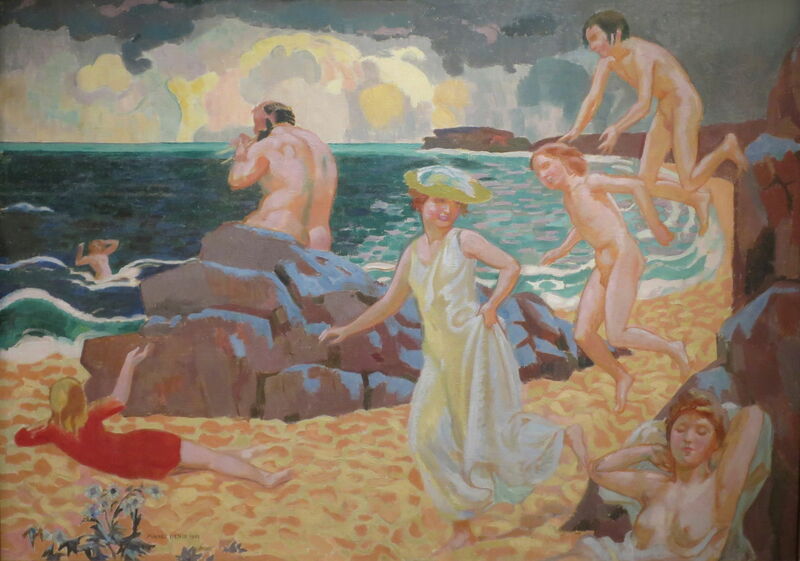 Wave from 1916 is another of Denis’ few paintings featuring nudes, with their forced classical poses. 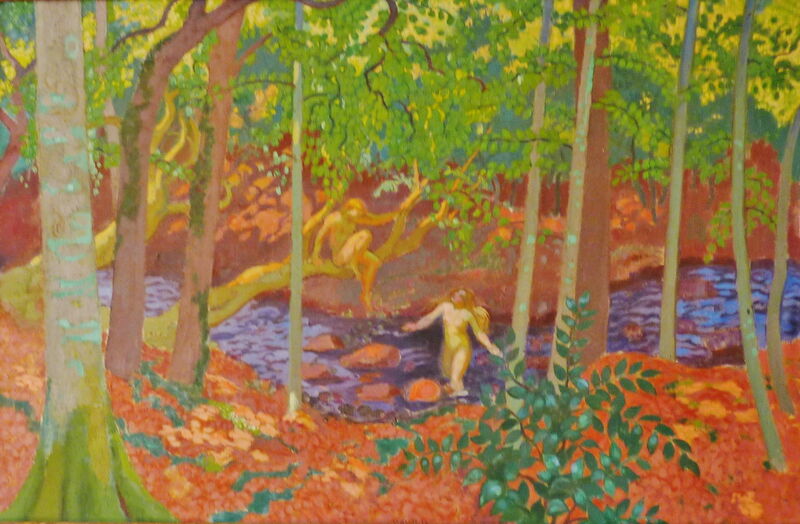 Maurice Denis (1870–1943), Daphnis and Chloë (1918), oil on canvas, dimensions not known, Private collection. Wikimedia Commons. I suspect that this painting of Daphnis and Chloë from 1918 was the result of Maurice Ravel’s ballet of that name, which was premiered at the Théâtre du Châtelet, Paris in 1912, coupled with his mythological series. After the First World War, Denis co-founded an atelier dedicated to sacred art, and his late works became increasingly devotional. 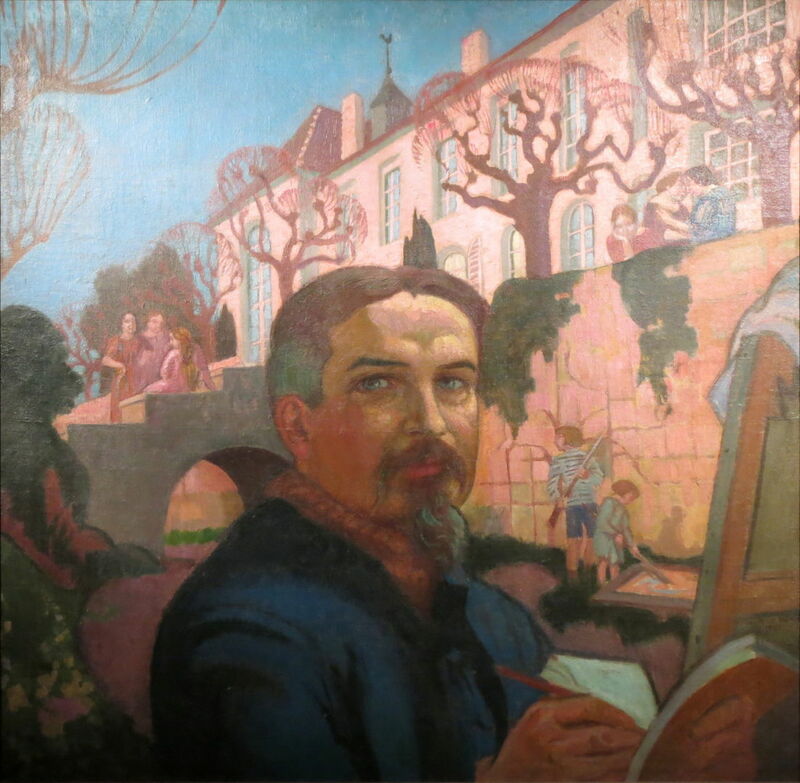 Maurice Denis (1870–1943), Self-Portrait in Front of the Priory (1921), media and dimensions not known, Musée départemental Maurice Denis, Saint-Germain-en-Laye, France. Wikimedia Commons. The best-known image of Denis himself is his Self-Portrait in Front of the Priory from 1921, when he had just entered his fifties, and is stood in front of the large mansion. Maurice Denis (1870–1943), Roundel with St Louis illustrating the cardinal virtue of Justice, in the choir of the St. Louis Chapel of the Priory (1914-30), media and dimensions not known, Musée départemental Maurice Denis, Saint-Germain-en-Laye, France. Image © Marie-Lan Nguyen / CC-BY 4.0, via Wikimedia Commons. 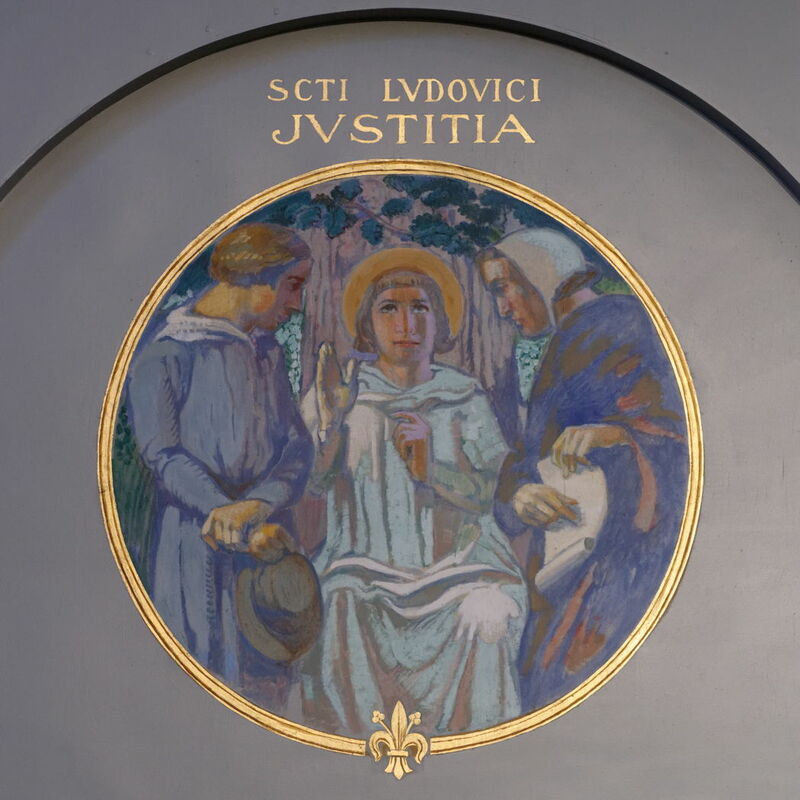 Some time between buying The Priory in 1914 and 1930, Denis painted this roundel illustrating the cardinal virtue of Justice, on the private chapel in its grounds. 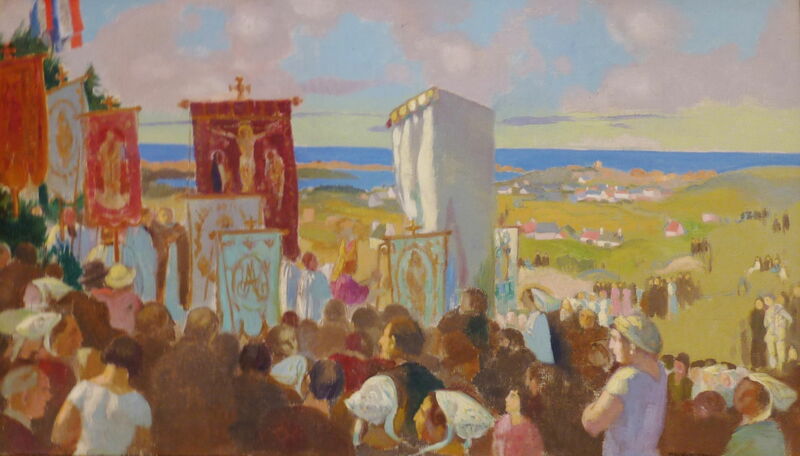 Maurice Denis (1870–1943), The Pardon of Notre-Dame de la Clarté (at Perros-Guirec) (1926), media and dimensions not known, Private collection. Wikimedia Commons. Denis appears to have continued spending the summer on the north coast of Brittany, near Ploumanach. Like other painters before him, including Jules Breton, he painted religious festivals there, including The Pardon of Notre-Dame de la Clarté in 1926. Maurice Denis continued to paint through the Second World War, remaining in Paris during its occupation. He was involved in a car accident in the city in November 1943, and died of the injuries he had sustained. Posted in General, Life, Painting and tagged Bonnard, Cézanne, Denis, Nabis, painting, Roussel, Vuillard. Bookmark the permalink.